Back in print after almost thirty years! 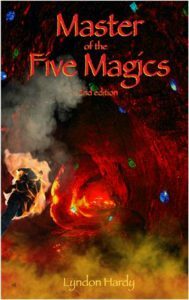 Alodar was a mere journeyman, learning the least of the five arts of magic. As such, he had no right to aspire to the hand of Vendora, Queen of all of Procolon. But aspire he did. Also includes an Author’s Afterward about how the book came to be, and a Glossary of terms and their Wikipedia URL links. As my bookshelves continue to grow, I can name only a handful of books that I continue revisit time and time again. Duncan’s Magic Casement series. Feist’s Riftwar. Moon’s Saga of Paksenarrion. And above all, Hardy’s Master of the Five Magics. I can’t say enough good things about this book. This book is flawless and fascinating. I can’t wait to read it again.